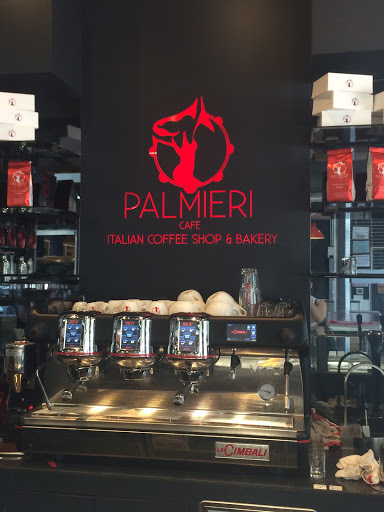 Palmieri Cafe is Dallas’ authentic Italian Coffee Shop and Bakery. Owner, Corrado Palmieri, is from Galatina in the providence of Lecce in Southern Italy also known as the “heel of the boot”. Their logo represents a “pizzica” a dance performed by a ballerina in Salento, Italy to remind them of their roots. 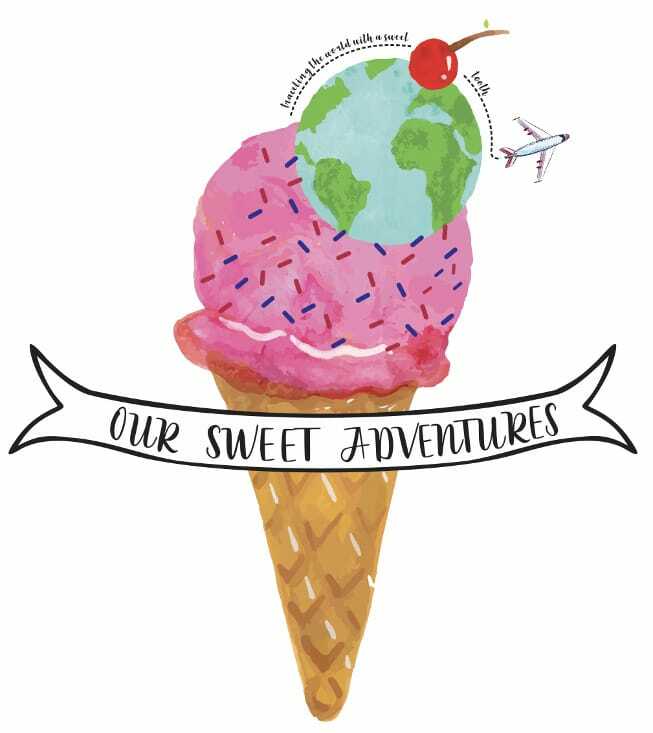 Roots such as authentic coffee made with the best coffee machine in Italy, La Marzocco and authentic Southern Italian pastries with recipes from Corrado’s pastry chef partner in Italy. 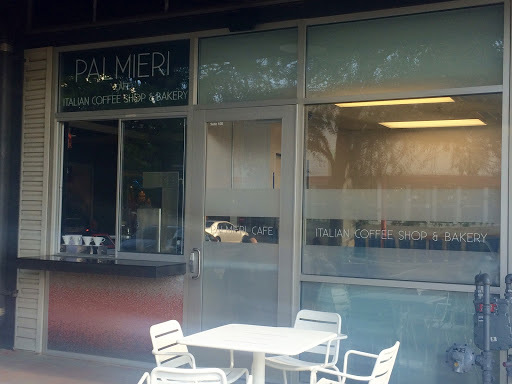 After growing local success from one of the stalls in Dallas Farmers Market’s shed Corrado finally found a permanent home for his Italian Coffee shop and Bakery on the corner of Dallas Farmers Market. I am happy to see that I am not the only one in Dallas that welcomes an authentic Italian pastry shop. 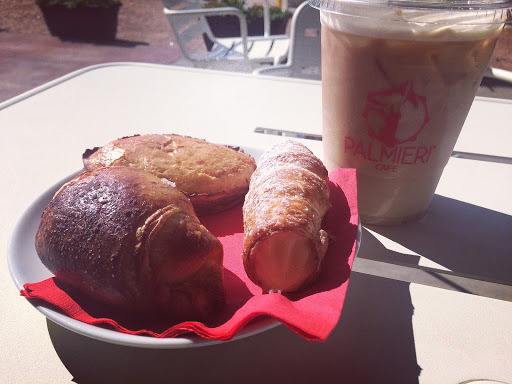 Palmieri Cafe sells both savory and sweet pastries that are made fresh every day. My advice is to come early because these amazing pastries sell out quick! 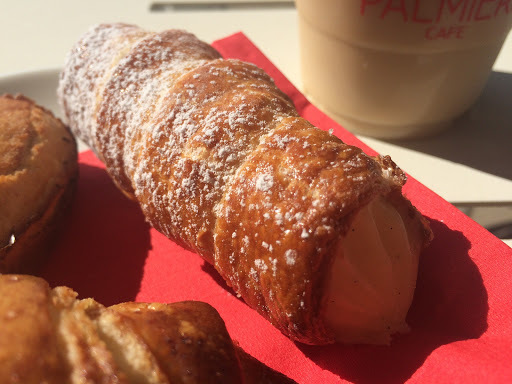 A cornetto is Italy’s version of a croissant so if you bite this wonderful pastry thinking you will get the typical crescent French croissant you will be disappointed. Remember this is a Southern Italian pastry shop therefore it will reflect its culture’s authenticity. A cornetto contains a lot more sugar in the dough and is not laminated with layers of butter as much as a French croissants. The result is a richer and more cakey dough that is left simple or filled with chocolate, nutella, cream, jam, etc. Thus bringing us to Palmieri’s delectable cornetto with chocolate. It was golden brown with a crisp crust and was indeed soft, sweet and cakey in the inside. The chocolate was rich and enhanced the sweetness of this pastry. With every bite the cornetto was filled with more dark chocolate until there was not a single bite left! Pasticciotto is one of the most popular pastries in Southern Italy! A pasticciotto is a short crust made with lard, a type of fat, to give a crisp crust and soft dough. The pastry is filled with either a ricotta based cream or a luxurious pastry cream with a variety of flavors like the traditional lemon or the fan favorite, nutella. The result is remarkable, a sweet cakey pastry with a flavorful creamy filling. Palmieri’s pasticciotto did not disappoint. The vanilla pastry cream was smooth and creamy, I think I could have just ate the cream with only a spoon it was so delizioso! The dough was naturally sweet and soft – baked to perfection. It is a heavier pastry than most, but worth every bite. Palmieri cannoli’s are simple and beautiful – no chocolate, pistachios, or candied citrus, just an original cannoli dusted with powdered sugar and filled with ricotta filling. The cannoli shell is very crunchy with a sweet ricotta filling. I could have easily enjoyed more than one of these for the filling is light and delicate while the cannoli shell is crispy thin. With every bite you hear the beauty of the cannoli shell crumble as you enjoy the contrasting textures of the smooth filling and the crispy shell.